This viewpoint would seem to go against the more commonly held view (at least among political realists) that “altruism” does not figure prominently in either the motivations of politicians or in the voting public. Politicians and voters give lip service to altruism, but their primary motivation is usually some form of self-interest. In other words, politicians say what they think their listeners want to hear. So they speak in vague generalities that are calculated to appeal to common sentiments. They talk of “change,” of “service” to one’s country, of need for “accountability.” Sometimes they are even, on a conscious level, sincere. They may believe in the vague ideologies that these expressions represent superficially—that is, they may have a sentimental connection to the rhetoric in which these ideologies are expressed. But their behavior is primarily motivated by concerns of self-interest (particularly status concerns). After all, politics is a rough, competitive sport; if the politician doesn’t look after his interests, he will lose his position to a less scrupulous rival. Political survival, in most (though not all) instances, easily trumps any “altruistic” principles that the politician may harbor. What about the supporters of the politician? If, in order to get elected, the politician must appeal to the altruistic sentiments of the electorate, doesn’t this suggest that altruism still plays a major role in the political farce? Again, we must be careful not to be taken in by superficial appearances. As I will explain in more detail in the next post, the primary motivation for the electoral class in a democracy usually revolves around self-interest. Individuals may wax eloquent about altruism and service to strangers all they like; but at the end of the day, their own needs, along with the needs of their loved ones, are going to occupy most of their attention. Admiration of “altruism” is, in most people, a kind of literary indulgence. One admires it in others and occasionally puts it in practice in the form of a bit of charity toward others; but the sort of "self-sacrificial," live-entirely-for-others" behavior denounced by Rand and her disciples is an exceptional occurrence. Rand is denouncing what is almost a phantom. Peikoff, however, in his contributions to this subject, is guilty of confirmation bias. He focuses solely on those instances in which politicians appeal to altruistic sentiments, while ignoring the very many appeals politicians make to self-interest. This is so obvious that one wonders how it is that Objectivists don’t notice it. Politicians are constantly promising things: more jobs, lower inflation, lower taxes, less corruption in government, assistance for those in need, bailouts for wealthy investors, subsidies for the medical care of the elderly, etc. etc. Appeals to altruism are merely added to these appeals to self-interest in order to make the whole business seem less sordid and mercenary. It is odd that Objectivists seem incapable of understanding this. "There are two major reasons why the best hope for political freedom is not to connect it ideologically with Rand’s ethical and metaethical theories. The first is that those theories are utterly unconvincing to almost everyone—even less convincing than libertarianism. Connecting the two together serves only to discredit the cause of freedom and individual rights. It plays into the hands of those who say that the only opposition to socialism derives from greed and selfishness." What Pareto says about “natural law” applies, by analogy, to Rand’s “moral argument for capitalism,” which is merely a series of loose assertions expressing Rand’s political preferences. It proves nothing beyond Rand’s emotional attachment to certain political convictions. It is rationalization through and through, with the vagueness of lofty abstractions used to carry forth what fact and logic could never have supplied. The action required to sustain human life is primarily intellectual: everything man needs has to be discovered by his mind and produced by his effort. Production is the application of reason to the problem of survival . . . . Since knowledge, thinking, and rational action are properties of the individual, since the choice to exercise his rational faculty or not depends on the individual, man’s survival requires that those who think be free of the interference of those who don’t. Since men are neither omniscient nor infallible, they must be free to agree or disagree, to cooperate or to pursue their own independent course, each according to his own rational judgment. Freedom is the fundamental requirement of man’s mind. Rand begins with the usual vague truisms: human life, she insists rather sententiously, "depends" on the mind. Very well. She belabors the obvious, but that's okay. It's preferable to what she does next, when she declares, without clarifying what on earth she is talking about, that “production is the application of reason to the problem of survival.” Uncritical people fall for this kind of rhetoric; they fail to notice the egregious vagueness of the term reason. What, after all, is this “reason” that Rand and her disciples pontificate about ad nauseum? How does one distinguish between an individual allegedly using Rand’s “reason” and an individual using some other cognitive method, such as intuition or the scientific method? Objectivists still haven’t gotten around to providing a detailed, empirically testable description of this obscure faculty. Instead, the most they provide is vague descriptions in which reason is defined in terms of other indistinct words, such as their claim that reason “integrates man’s perceptions by means of forming abstractions or conceptions” and “the method ... reason employs ... is logic.” None of these descriptions tell us how reason integrates perceptions, or what Rand means by “logic”; nor do they allow us how to empirically test Rand’s assertions about “reason.” They are little more than a series of arbitrary claims, their dubiety masked by their inexactness. Yet the difficulties embedded in Rand’s vague concept of reason pale in comparison to the much worse difficulties that confront us when we examine the next step in her argument, where she argues that “freedom is the fundamental requirement of man’s mind.” Here, again, we run into the problem of vagueness. What does Rand mean by the term “freedom”? Her disciples would probably say: “She means laissez-faire capitalism.” Very well. Why didn’t she just say so right from the start? The answer, again, is fairly simple: she used the more generic (and vague) term freedom because if she claimed that laissez-faire is “a fundamental requirement of man’s mind,” her argument would clearly go against obvious facts known by nearly everyone. As Rand and her followers are the first to admit, pure “laissez-faire” capitalism has never existed; yet this has not prevented all kinds of amazing scientific and technological advances, all of which can be vaguely attributed to the human mind (though not necessarily to “reason,” as we shall see). So it turns out that laissez-faire is not a “fundamental” requirement of man’s mind”: any sort of free enterprise, even one as “heavily” regulated as the American version, will do. ...when we try to decide what to expect in a certain situation, and how to behave ourselves accordingly, we are likely to do a lot of irrelevant mental rambling, and the first thing we know we find that we have made up our minds, that our course of action is settled. There seems to be very little meaning in what has gone on in our minds, and certainly little kinship with the formal processes of logic which the scientist uses in an investigation. We contrast the two processes by recognizing that the former is not reasoned knowledge, but "judgment," "common sense," or "intuition." There is doubtless some analysis of a crude type involved, but in the main it seems that we "infer" largely from our experience of the past as a whole, somewhat in the same way that we deal with intrinsically simple (unanalyzable) problems like estimating distances, weights, or other physical magnitudes, when measuring instruments are not at hand. To sum up: Rand’s “moral” argument for capitalism, to the extent that we can decipher any kind of distinct empirical content in at all, oversteps obvious facts. Rand in her argument appears to be guilty of conflating “freedom” with laissez-faire capitalism; in any case, her implication that survival requires freedom from “interference” (i.e., laissez-faire) is obviously contradicted by facts known to everyone (i.e, by the fact that, despite the absence of laissez-faire, we’re still alive). Nor is Rand’s assertions about “reason” empirically sound; for, in practical matters, men rely far more on “intuition”; nor is it clear, given the uncertainties and complexities faced in ordinary business, that it could be otherwise, since formalized systems of thought can’t handle great complexity and uncertainty. Natural disasters and state assistance. Does the government have a role in helping people whose homes have been destroyed or severly damaged in a natural disaster? I was reminded of this issue by a 6.5 earthquake that hit this last weekend just twenty miles from where I live, knocking over bookshelves and CD racks. As natural disasters go, this one was very minor—hardly even worth troubling about. But it could easily have been much worse. Forty miles to the south three massive plates come together, creating tensions that could spill over into moster quakes. Twenty years ago the area generated a 7.0 quake; yet it is fully capable of generating quakes comparable to the Anchorage and Indian Ocean quakes. The destructive capacity of nature is immense. Whether it's earthquakes, tornadoes, hurricanes, tsunamis, volcanic eruptions, floods, these events can devestate entire communities. Yet oddly, Rand and her disciples have very little to say about these "Black Swan" events (to borrow Nassim Taleb's terminology). One could imagine Rand criticizing the mere mention of them as evincing a "malevolent" sense of life. After all, they don't happen all that often: so why dwell on them? Although they are not an everyday occurence (at least in any given locality), nonetheless they do happen; and most people have a fairly strong conviction that the government has a role in assisting the victims of catastrophic natural disasters. Claiming the state has no role is a hard sell. Why should the state do nothing? It is precisely in a catastrophic disaster that collective action governed by strong leadership becomes advantageous. To oppose such action appears to be mere obstinacy, with neither wisdom nor good sense in support of it. It is here that Rand's principle-centric approach gets her into trouble. Principles, for Rand, are invioble "absolutes." Only an individual suffering from an "anti-conceptual mentality" would approve of violating a principle. Yet this view of things presupposes an orderly, linear, "logical" universe; it assumes that the non-linear, the disorderly, the non-logical either doesn't exist or is "non-essential." Such assumptions, however, go against facts that confront us in everyday life and in history. As Nassim Taleb reminds us, "the world is more nonlinear than we think, [or] than scientists [and Rand] would like to think.... Linear relationships are truly the exception; we only focus on them in classrooms and textbooks because they are easier to understand." Principles that work fine under ordinary circumstances often break down under exceptional circumstances. Hence wisdom counsels flexibility. When confronted by a rare, extremely impactful event, the individual may need to improvise. Obstinacy on behalf of one's principles, far from being a mark of intelligence and "rationality," merely demonstrates an inability to adapt to new circumstances. "[Ayn Rand was] A woman who was able to define new paradigms in metaphysics (the man-made vs. the metaphysical, the ontological status of the laws of logic, the derivation of causality from the law of identity), in epistemology (measurement omission as the connection between similarity in objects perceived and concepts formed from them, perception as being "the given" in a form, the identification of the "fundamental" and the "essential", the way in which definitions can be true or false, the complete undermining of the stultifying idea of the analytic-sythetic dichotomy. the inclusion of value concepts in the demonstration of measurement-omission, the standard of objectivity), in ethical theory (the meta-ethical connection between life and value that once-and-for-all answers the question what end-in-itself is served by values, the difference between standard and purpose, the fact that all elements of value theory apply to the individual living being, the refutation of deontological value theory and hedonism [two forms of subjectivism], the development from this of peaceful principles of social relations, the development from this of a value-grounded view of individual rights), in political philosophy (the grounding of freedom as a basic human need, the foundation of Capitalism on value theory, the delineation of the role of government, the rejection of forcible taxation and a moral method for financing government, racism as a particular kind of evil, the identification of self-interest as applying to the foreign policy of the government of a free society), in esthetics (the definition of sense of life, its relation to art and philosophy and psychology, the criteria for exemplars of the different branches of art, the definition of art itself)...all flow from a mind that was so original, one can honestly say she looked at reality first-hand and asked what was there...and clearly understood the methods and arguments and conclusions of all other Western philosophies, so as to not repeat their mistaken by-paths. Rand was not a second-hander, seeking a way to fit into niches of difference so that her philosophy would be unique among the others. That is a task that is utterly impossible, if one starts that way. She started by looking fresh and new, with a well-developed rationality, at reality itself, so that hers accurately describes what really is." 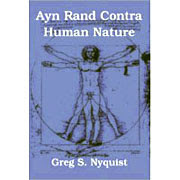 "...your interminable encomium to her philosophical breakthroughs resembles the tall tales attributed to a mythological hero or saint, rather than a description of any bona fide towering intellect (Goethe, Newton, Darwin, Einstein)The main difference between saying that Paul Bunyan's giant axe carved the Grand Canyon, and saying that Ayn Rand invented a revolutionary epistemology, or bridged the "is-ought gap", or successfully grounded capitalism in ethics, is that at least the Grand Canyon is really there."